He sticks to a simple plan, "Write What You Would Read...put in some music you would listen to, and sprinkle in some hotties." One day, notoriety shines in his direction; people take notice and offer to pay for his words. Contrary to what some think, I have a 'real' job and often, I wear a suit and tie. Like my day job, I treat blogging for pay with high seriousness and grace. You will not see scantily clad, sprinkle encrusted, pole dancers next to copiers. I will not use adult language. I met Patricia and The Imaging Channel(TIC), after three JD's (doubles) down at Harley Davidson, Orlando. How I got there, I am still not sure. Weeks later, emails exchange, I gain the opportunity to express on a more conservative and mainstream platform. Interesting point here regarding DOTC. Writing for a 'real' publication will force me to expand this(DOTC) side. 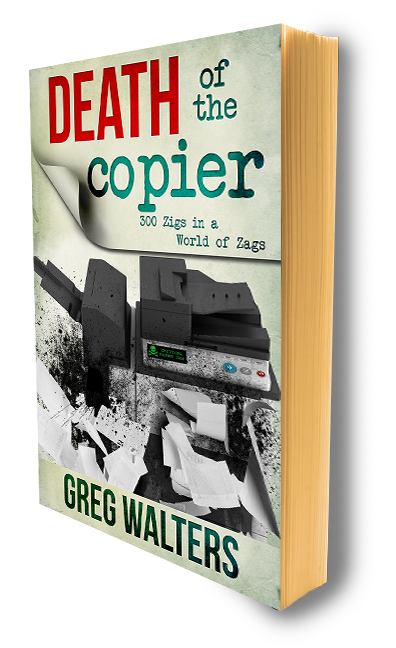 So I will be pushing the Edges, coloring outside of the lines and keeping to The Right of the Bell Curve even more, over here on, TheDeathOfTheCopier. This is going to be good. Maybe not as good as a really, slow, Debra Winger-type, mechanical bull ride, but, I can live with that.